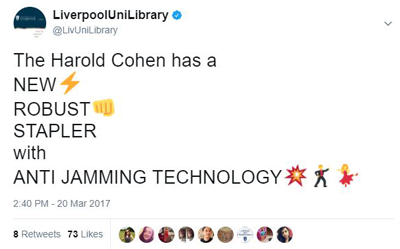 The social media team at the University of Liverpool Library runs a popular verified Twitter account with over 9,000 followers and is enthusiastically involved in a variety of social media platforms. Since starting a period of sustained improvement, our use of social media has progressed from being a passive channel used to broadcast news and service changes to being an active method of communication in a digital space our users already inhabit. Working collaboratively, the social media team has established a cohesive and clear library voice with a consistent style and tone. This article looks at the development of the library voice with a particular focus on the use of creative, interactive and fun methods to cultivate the library personality. It also covers some of the challenges associated with this type of relaxed and experimental approach to social media and gives examples of special events used to engage and interact with students. 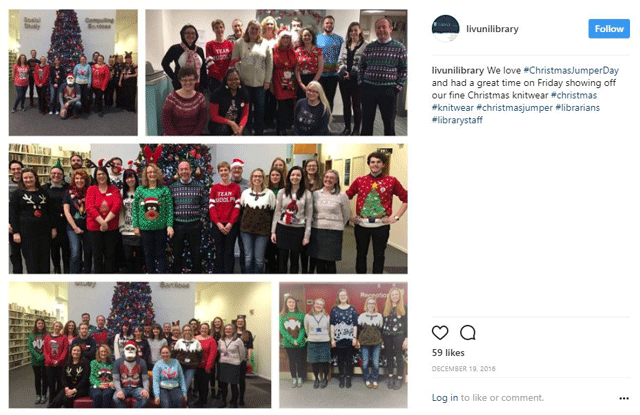 In recent years interest in social media amongst academic libraries in the UK has grown enormously and there are diverse approaches to managing social media across the sector. It can be hard to make social media work productively in an academic library setting and this is a source of much discussion. 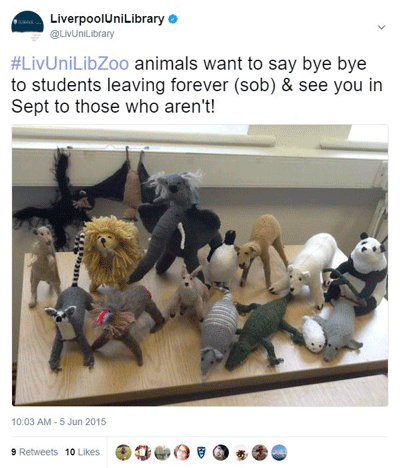 Since 2013 the University of Liverpool Library has taken a team approach to all social media. It is this team approach, coupled with an interest in experimentation and a focus on creating and maintaining one coherent library voice, that has ensured the rapid growth and continuing success of social media at Liverpool. In early 2013 a review of the library provision at Liverpool set out a need for us all to consider ourselves as part of one library service rather than separate library sites. This gave us the impetus we needed to change towards developing one clear identity on our social media channels. The new social media team was able to start with a vision and the freedom to identify and settle on what felt right. Through trial and error, we started to see a pattern of successful tweets: which tweets worked well and which fell flat. Often they would involve images, but not always, and largely they tended to be the slightly more idiosyncratic and off-the-wall tweets. 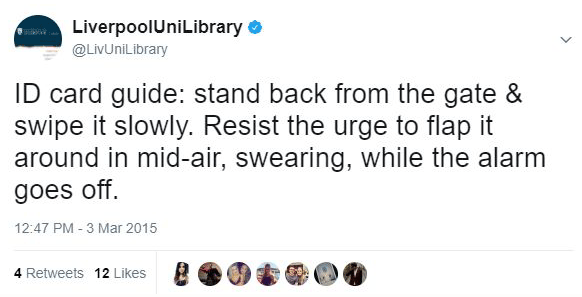 Over time it became apparent that the successful tweets were those that gave the Library a clear human voice: someone who is slightly cranky, sometimes annoyed, but with a sparkling wit and who above all always has the students’ best interests at heart. Initially, this tone came from a library assistant with a flair for putting together succinct and engaging tweets. As we saw how students liked this style of tweeting, other members of the team started to follow suit, putting our own twist on this template. From complaining about different chairs being muddled up, the sad demise of our long-suffering stapler or the inability of our students to correctly operate the Library entrance gates, these mundane slices of Library life let the students into our inner thoughts, giving them a glimpse of the human personality behind the account and the people working in the Library. By taking time to communicate and connect with our students we are building meaningful relationships with them. This has enabled us to create a sense of community and one that they can influence and it means that when we need to tell them to bring their books back, that the Library will be closing early or that an electronic resource is going to be suffering from downtime, we already have our audience. We get to sneak in the sensible stuff without them noticing. To successfully target our social media message, we identified our audience. As Lorri Mon sets out in her book on social media and library services, ‘The library’s intended audience and the purpose of the library’s message also should strongly influence how social messages are constructed’.2 Our audience is primarily our current students, then academic and professional services staff and finally the wider library and academic community. We try to keep our main audience in mind when we create our content. In the Librarian’s nitty-gritty guide to social media, Laura Solomon identified social media as a tool for developing a community, not for one-way broadcasting, and that really effective social media use will take time: ‘building a social network is not something that happens overnight’.3 Our experience confirms this. It has taken time for us to understand what tone we should take and for our community to develop. Solomon also says that ‘effective social media should be envisioned as a two-way medium, allowing customers to receive information but also communicate with the Library’.4 If we were to simply broadcast information without any thought of getting a reaction or response, then we would not have such a high number of followers, and certainly no tangible interaction. The way we operate our account allows our personality to shine through, offers a platform for our team to perform on and gives us a high level of audience engagement and interest. Finding our library voice has been the key to understanding how we can appropriately target our content. As Solomon emphasizes, you should ‘… talk like a person! Be human. Ditch the institutional jargon. Get rid of the formal tone’.5 She also goes on to say that in an ideal world you would only have one person in charge of the library’s social media in order to ensure a consistent voice. We have been able to ensure a consistency of voice by working collectively and developing together an understanding of who we are as a Library and the image we want to project. Our team approach allows us to ensure quantity of output that one person alone would never be able to achieve. We do not have a designated social media officer within the Library so it falls to the social media team to generate the content and ensure the Twitter feed in particular is kept up to date and conversations get started and continued. 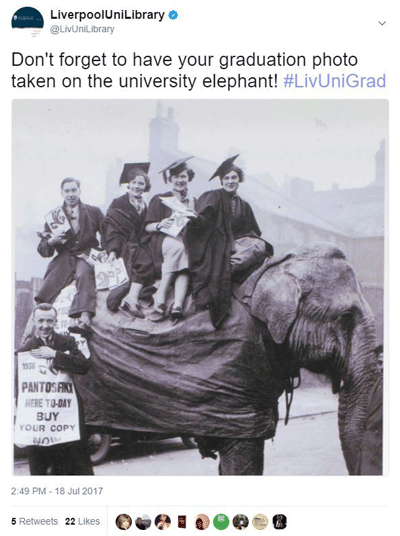 Some examples of our popular tweets cover topics such as chairs, temperature, ID cards, the Library zoo (#LivUniLibZoo), graduation, staplers and material from our Special Collections & Archives (#LivUniSCA) (Figures 1, 2, 3, 4, 5, 6, 7). Rather than every member of the team contributing to Twitter at the same time, which would create a cacophony of different competing voices, we have four members of the team who regularly tweet and others who either concentrate on behind-the-scenes idea generation or contribute more infrequently when something comes to mind. Different members of the team have different interests and concerns, all of which add to the breadth of our library voice. 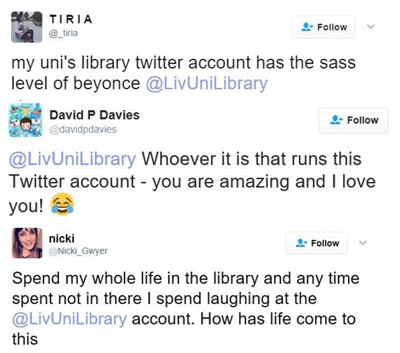 In an interview with the Efficiency Exchange in April 2017, Eric Stoller, an education consultant with a passion for social media, spoke about the University of Liverpool Library Twitter account, saying, ‘The voice of that account is captivating, it is engaging, there is personality behind it’.6 It is this account personality that we are most focused on developing. One aspect of our library personality is the way we like to get our Library users involved in interesting and entertaining activities. Throughout the year we run different events designed to engage students, enhance their happiness and well-being, and show the human side of Library staff. At Easter we run an egg hunt just before the start of Easter break. At first we planned to hide creme eggs around the Library. However, the realization that some might lie forgotten in an often hot building made us revise our plans to avoid unwelcome melting chocolate incidents. 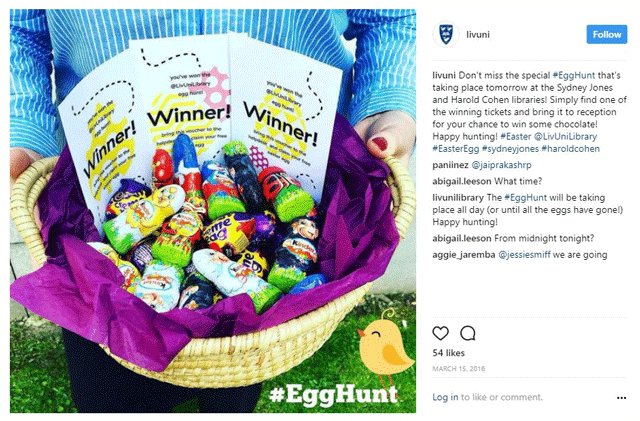 One team member is a talented designer and he designed a distinctive egg hunt voucher which students had to find hidden in the Library. They could then take the voucher to the Library help desk to be redeemed for a choice of chocolate egg from our lucky dip. Students were encouraged to follow #EggHunt on Twitter to find clues to where the eggs were located. For those not on social media, posters displayed at reception and on plasma screens around the Library informed them of the competition. Through our contact with University Marketing and Communications, we also worked with a student PR group who came and took some effective publicity photos and promoted the event on the University Twitter and Instagram feeds (Figure 9). 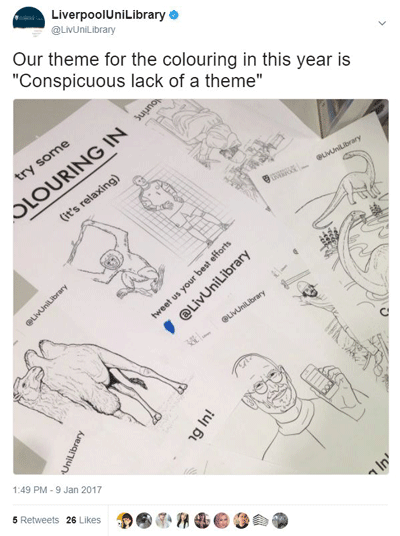 Tapping into the trend for adult colouring in, we set up colouring stations throughout the Library. We are not alone in offering this and it appears to be a popular way to encourage students to take a break. Display boards were set up to exhibit the results and many students took the opportunity to colour in and relax. Initially we provided pictures of different cat breeds for obvious reasons, but, having exhausted the range of freely available cat printables, we soon moved to other animals, famous historical characters and miscellaneous figures (Figure 10). Launched in May 2015, finding our hidden golden tickets is our most popular revision week activity. Once found, students can redeem them for prizes. At first, students could exchange golden tickets for a hot drink at campus cafés. However, co-ordinating this with the various venues became difficult so in May 2016 we offered a lucky dip at the Library help desk instead. Students could exchange a ticket for one of the prizes in the lucky dip, which included chocolate or cereal bars, USB pens, refillable water bottles and coffee vouchers. We revised this again recently to a selection of items in individual bags which students could collect from the help desk. The bags were decorated with ‘with love from @LivUniLibrary’ stickers and contained a mix of items including lollipops, teabags, chocolate bars, USB pens, highlighters, Library pencils, pens and some promotional bookmarks. Customer Services staff were able to share the delight of the students and take photos when they came to collect the bags, ensuring as many staff as possible were involved in the event. We have tried many different ways in which students can win a ticket, including asking them to tweet revision tips, favourite revising music or photos of revision notes. However, by far the most popular is the treasure hunt, with tickets hidden in books or corners of the Library. 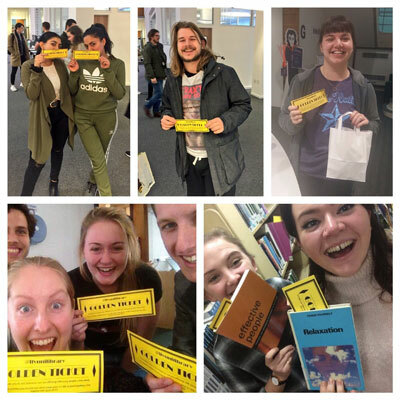 Encouraging students to tweet pictures in order to win something can be difficult but they will often spontaneously tweet photos of their tickets or are happy to have their photo taken by staff when they come to claim their prize (see photos). Littering in Library spaces is increasingly an issue during busy times and over weekends. We initially tweeted pictures of the rubbish left behind by students, but, without any context, students took little notice. Customer Services staff on the social media team were particularly frustrated as they often spent most of Monday morning collecting rubbish left in study rooms over the weekend. It was decided therefore to make a concerted effort to highlight the problem. 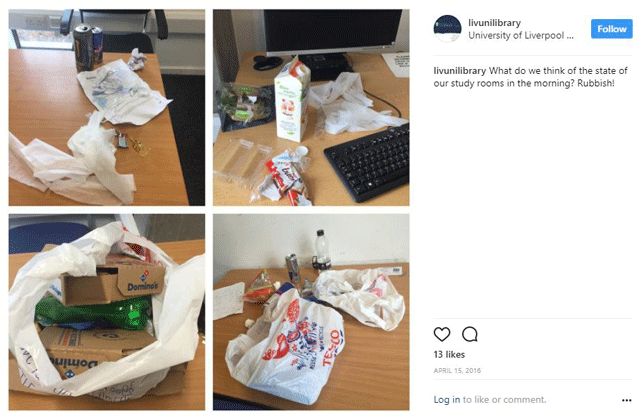 For a few weeks on Monday mornings, team members took pictures of any rubbish that was left in the Library over the weekend and put the pictures on Twitter and Instagram (Figure 11). We felt that if students were able to see the result of their casual behaviour then we would perhaps begin to see an improvement. Many of the comments we received on Twitter were from students who were appalled to see the level of littering, but also from other University Library Twitter accounts showing sympathy with the situation. This project is ongoing and designed to nudge behaviour. We are slowly starting to see a difference. 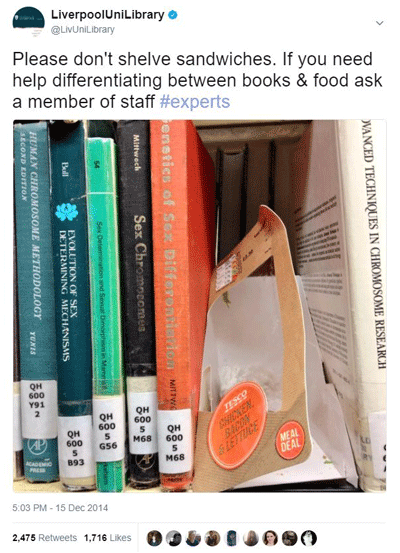 Other ways in which we have highlighted the littering problem in the Library include the now infamous #shelfwich, which, despite its focus on littering, has become our most successful tweet (Figure 12). Taken on the spur of the moment by a team member, the tweet was so unexpectedly popular that we only came up with the hashtag #shelfwich the following day. It has had over 2,000 retweets and occasionally resurfaces even now, nearly three years after it was first tweeted. Something about the juxtaposition of the library books and the empty sandwich wrapper clearly caught the popular imagination. Tweeting librarians were very concerned about the correct way to classify a chicken, bacon and lettuce sandwich using Library of Congress classification. One tweeter pointed out that the packet should plainly have been at TX not QH. Whether this viral tweet has helped in any way to reduce the level of littering in the Library, we are unsure. Recently, the University increased numbers of cleaning staff in the Libraries, thereby reducing levels of littering and also consequently opportunities to find rubbish in unexpected locations. Since adopting this more experimental approach to social media, our main challenge has been maintaining consistency of tone. Having such a large team means it can be hard for us all to act as one coherent identity, but, through discussion and working together, we have developed our library voice. Allowing members of the team to express themselves and not be afraid to experiment gives people the confidence to produce exciting content. It can also be difficult to ensure that Library staff members beyond the social media team feel they are involved and can offer ideas for content. To help with this we ensure that team members represent every Library section, thereby providing all staff with a social media representative with whom they can liaise and provide content. Measuring and quantifying success is another challenge, and one that is shared amongst all organizations and institutions using social media. We can of course count followers but what really matters is engagement. What encourages people to interact with a tweet? This is much more difficult to quantify and we are constantly looking for ways in which we can ensure engagement, other than identifying popular tweets and posts and replicating them. Finally, and probably most importantly, we need to ensure our audience understands what we are trying to achieve with social media. When we began, there was concern that we would be inundated with complaints and rude comments from students, but this has not been the case and we rarely receive any serious complaints. In fact, most people who do have a complaint are ultimately pleased to have had an immediate and friendly response from the Library. Our Twitter account was verified in November 2016, which of course adds a degree of authority to our tweets though also comes with a new level of accountability. We recognise this responsibility but would certainly not wish to start censoring ourselves or return to the days of being overly concerned about professional integrity or the potential for reputational damage. We aim to balance being the official face of the Library and representing the individual observations of the staff that work there. Our experience at Liverpool proves that you should not be afraid to experiment or make mistakes. Of course not everything will be a great success. For every tweet that gets ten likes or retweets, there will be one where all you hear is tumbleweed. Do not be disheartened, as in our experience, if you demonstrate to students who you really are, they will appreciate it and respond extremely positively. Our students’ response really encourages us to continue to find new and innovative ways to capture their interest in our Library service as a whole (Figure 13). Making social media work can be a challenge; it takes time and effort to generate relevant and interesting content but finding and maintaining your library voice can really help. If you know who you are and what you should sound like, then what you want to say will come more naturally. By being ourselves and allowing a clear human personality to develop, we have rapidly increased our number of followers and improved the depth and quality of the interaction and student engagement that our social media accounts achieve. Chatten, Z and Roughley, S (2016). Developing Social Media to Engage and Connect at the University of Liverpool Library. New Review of Academic Librarianship 22(2–3): 249–256, DOI: https://doi.org/10.1080/13614533.2016.1152985 (accessed 12 July 2017). Mon, L (2015). Social media and library services. California: Morgan & Claypool. Solomon, L (2014). 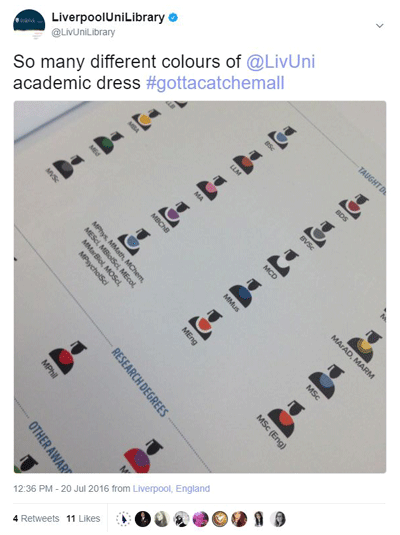 Librarian’s nitty-gritty guide to social media. Chicago: American Library Association. Solomon, L (). ref. 3. Efficiency Exchange (2017). Social media in higher education: it’s ok to fail. Interview with Eric Stoller, http://www.efficiencyexchange.ac.uk/11141/social-media-higher-education-eric-stoller (accessed 12 July 2017). Now That’s What I Call Knitwear: (). https://play.spotify.com/user/livunilibrary/playlist/1mGHlq8k1PdTMfJJcNOTMU (accessed 14 July 2017). McGinley, D (2016). The library have made a boss exam motivation playlist. The Tab – Liverpool, https://thetab.com/uk/liverpool/2016/01/15/library-made-revision-playlist-need-29609 (accessed 5 September 2017). EatSleepReviseRepeat (also take breaks): (). https://play.spotify.com/user/livunilibrary/playlist/15rr9JuGXd72niiIN9zUqJ (accessed 12 July 2017).